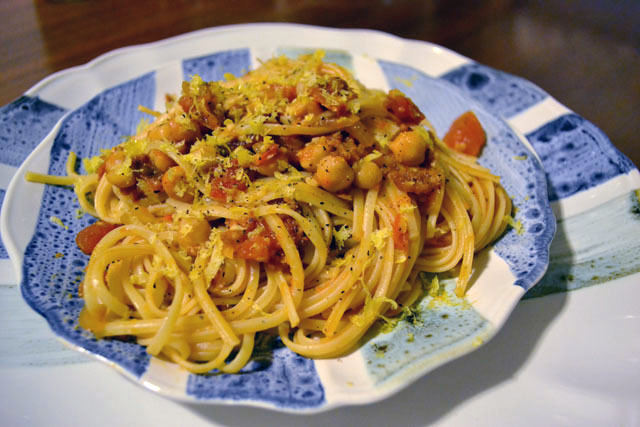 In honor of National Spaghetti Day I am posting this fantastic Spaghetti with Chickpeas recipe that I adapted from Smitten Kitchen. As soon as I saw this recipe back last year I knew I would have to make it one day. That day finally came this winter and it was worth the wait. We loved it. I made minor changes to the original recipe based upon our preferences, as well as what was in the cabinet. We didn’t have basil so I didn’t put that in. We didn’t have ham but we had bacon so we used that. I’m sure that if you don’t eat meat you could use a meat substitute and still be happy. The essence of this recipe, and what I believe most about cooking, is that it has good structure but you can dress it up how you wish. The one thing that I loved about my version was that I used lemon in the dish. I love hummus and I love hummus when it is very lemony so I felt that using lemon zest instead of grated cheese would be a fun twist on the garnish. I can’t suggest this recipe enough. It’s all kitchen staples that you can find in your cabinets. It is so comforting and satisfying. Because of the carb-loading nature of this dish we filled up quickly so we stretched this huge meal out for 8 portions. That makes for a really economical dish when it breaks down per serving. As we resolve to save more this year, this aspect of the dish works well for us. It’s time to celebrate spaghetti so it’s time to sort through your pantry staples and make this for dinner tonight! Boil salted water for the pasta, cook until al dente. Reserve one cup of pasta water prior to draining. As you heat the water, divide the rinsed chickpeas by measuring 1/3 cup of chickpeas and setting the rest aside. Blend the 1/3 cup chickpeas with the lemon juice until the chicken peas are roughly chopped. Cut the bacon into small pieces with kitchen shears. In a large skillet, cook the bacon until fat has rendered out and bacon is evenly browned. Remove all but 2 tablespoons bacon fat from the skillet, add the sliced onions, minced garlic, and chili flakes. Cook until the onions and garlic are translucent, about 5 to 8 minutes. Add half the tomato sauce to the cooked onion mixture. Once the onions and sauce have been combined add the ground and whole chick peas and the bacon, stir to combine. Serve with lemon zest, salt, and freshly ground pepper. Bacon, spaghetti, and chickpeas? I’m innnn. Chickpeas and spaghetti sound really weird together but if you say it’s good, I’ll give it a try! It looks amazing! I missed National Spaghetti Day 🙁 I’ve never had spaghetti with chickpeas but I like both so I think I will like this 🙂 Happy 2012!